RoyalEnfields.com: Royal Enfield C5 Bullet on its way to U.S.
Royal Enfield C5 Bullet on its way to U.S. The Royal Enfield Bullet Classic 500 motorcycle—dubbed the C5—is on its way to the United States. They are due here June 5, Kevin Mahoney, the U.S. importer, told me. "I'm happy to say that we finally have some heading our way by sea. God and pirates willing," Mahoney writes in his recent Community Newsletter email. 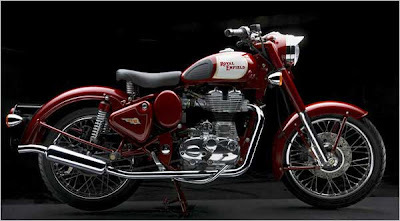 The C5 is the new top-of-the-line Royal Enfield, combining the most old fashioned styling (it looks like a 1951 Royal Enfield) with the most modern technology (unit constructed engine, fuel injection, five-speed transmission, disk front brake). "Europe was the first to receive the C5 and has production priority at the moment, so supply in our market will be tight at first. If you're set on owning this model, I suggest you put a deposit down with your dealer," Mahoney writes. "We're working with dealers to dispatch our first shipment of these beautiful bikes based on deposits, so make sure you have a spot in line." Suggested Retail Price is $6,395. Shipping, set up and taxes will be extra. A two-year warranty is included.